The Fourth Plinth: an invisible reproach to Britain. The fourth plinth in Trafalgar Square has been filled! It’s a life sized replica of the Ninevah winged god destroyed by I.S. in 2015. It’s very arresting and delivers a powerful message opposing cultural destruction. But not as stunning as if it depicted all the recordable artefacts legally not reported by British detectorists and lost to science since 1975. But to do that it would need to be hundreds of miles high! Stonehenge: actually, there is ZERO archaeological benefit! Much is made of the “knowledge dividend” that digging a mile long scar through the landscape will deliver. But one has to ask: if it’s so beneficial why not do it anyway without building a road?! Clearly the dividend isn’t a true benefit it’s an excuse for supporting massive destruction. The East Kennet Long Barrow is little regarded compared with its celebrated and far more visited neighbour, West Kennet Long Barrow. This inequality is unjust, firstly because East Kennet is enormous – a cathedral to the parish church that is West Kennet – and secondly because, unlike the opened, eviscerated West Kennet, graffitied, tealit and crassly modernised, robbed of its bones and mystery, East Kennet has not been opened. This makes it very special amongst the Wessex monuments which have been repeatedly exposed in the name of science or greed, with another neighbour, Silbury, being the most famous example. Unlike in that case, no endless succession of inquisitive seekers has bored into East Kennet in pursuit of that which they destroyed and no-one has felt the need to apologise by writing “Bones of our wild forefathers, O forgive, if now we pierce the chambers of your rest”. Everything – and everyone – within East Kennet lies safe and secure, just as intended by those who sealed it 250 generations ago. Uniquely, miraculously, East Kennet hugs within itself a last precious cache of unsullied mystery. For me the choice is the reverse, and clear. For surely, all the gains combined could not compensate for one particular loss: the loss of the last and greatest of Wessex ‘s jewels – the last, true, flawless mystery. Where is the wonderment at West Kennet? What poet can sit alone on its turf and fancy he hears ancient whispers in rustling leaves? Who can visit the mysterious past by pausing at a display case of bones? Who can stand by poor Silbury without an uncomfortable feeling we have betrayed real people who created a private wonder and that we owe them a profound apology? Are we to assert that this is our time, not theirs, our hill, our barrow, our heritage, our mystery? Do we flout the wishes of other humans on the simple grounds that they are dust, we want to and can? Is this the future we want for ourselves? Ever wondered how Historic England officials sleep at night? Surely there are limits to what is acceptable change at our national icon? Do the changes below fit in with their other 4 aspirations? Or is the truth that our Heritage Champions can only think that if they keep their eyes tightly closed? UNESCO: “The benefits of a 2.9km tunnel to the centre of Stonehenge World Heritage Site cannot be offset against the damage it would cause to other parts of the site.” Historic England say they disagree. Sleep tight, Heritage Champions! We thought we’d mention our Artefact Erosion Counter (of artefacts removed by detectorists since 1975, mostly unreported) recently reached 13 million! If each was an inch wide they’d stretch the 200 miles from the British Museum to the Louvre in Paris – where, no doubt, archaeologists would speak out. If however our estimate of the number of detectorists is wrong and Dr Sam Hardy is right they’d stretch 600 miles, almost to the Museo Archaeologico in Rome – where. no doubt, archaeologists would also speak out. Meanwhile in London, archaeologists who are equally dedicated but are captives of the prevailing legislation, will soon plan another Conference praising the PAS and the small minority of detectorists who report to it. No-one will be highlighting the trail of lost history stretching to Paris or Rome although some detectorist-attendees will no doubt be smirking about the likes of us and our “lying Counter” in the tea break…. A new Finds Liaison Officer – and this one’s facing a difficult job interview! Awkward, or what? Day after day the poor new Finds Liaison Officers will have to keep to the Portable Antiquities Scheme line and liaise with hundreds of people who aren’t part of an archaeological survey, and don’t have a proven track record and haven’t conceded that the finds all belong to the farmer! Indeed, many will have come from rallies involving twenty quid a day, undisturbed pasture, lots of crop marks, loadza dealers on site, no compulsory recording and no showing finds to the farmer. So that’s how it’s going to work, if “work” is the right word. The FLO will wear blinkers about the circumstances of finds whereas the Local Authority which provides his or her office, laptop and telephone won’t. Oh to be a fly on the wall at the interview! Moving on, the iconic Lanyon Quoit is an ‘Image of Cornwall’ that many people outside of the Duchy will immediately recognise. The quoit fell in the early 1800’s and was restored in 1824. Before the restoration, it was said a man on horseback could ride beneath the capstone. This is no longer the case, as you can see. Look for more videos in this series in the coming weeks. What can the present tell us about the past? The present can both inform and confuse our understanding of the past and help us appreciate the limitations of what we can deduce from what we see and find. When studying the past we rely on the tangible remains left by previous generations and skilfully manipulate this data to create a narrative. The passage of time inevitable erodes both our understanding of the cultural character of the people we are studying and the amount of surviving evidence. This is especially the case with prehistoric studies where our understanding is inevitably severely compromised. Snippets of data are analysed, hypothesis created and conclusions offered. But just how reliable are these conclusions? We really can’t be sure. Take the modern public bench. These are scattered in ever increasing numbers through the urban and rural environment. We all know what they are for and often why they are where they are. At the basic level they are all built to sit on, but there is much more to the humble public bench than this. Thousands represent memorials to individuals as the plaques on them testify, others are carefully positioned to permit a spectacular view, whilst others are arranged neatly around places where sporting activities occur. Many others are strategically placed at the places where people congregate to utilise public transport and others are situated helpfully outside shops to provide respite for the laden down shoppers. So the distribution of these single function items is varied and reflects a myriad of different factors, needs and aspirations many of which would be difficult to fathom out without their social and cultural context. If one assumes that 90% are then removed leaving no trace, then the chances of understanding them is further compromised or indeed futile. As archaeologists we would look at the surviving distribution to help us understand them but we would also look at differences in their form. When it comes to public benches the variety seems endless. Different materials, sizes, shapes and layout are normal and indeed even within a limited geographical area, considerable differences in form appears to be the norm. Do these differences mean anything? Again, as archaeologists we would probably try and seek reasons for the considerable variety in form and distribution and seek to analyse the evidence to see if it could tell us anything about them. Are they ritual? The memorial plaques on some of them might suggest that they are. Perhaps monuments raised to commemorate certain people or events. Perhaps the horizontal surface was formed to received votive offerings. What about those without plaques? Did they have a different function or has the plaque been lost? What about associations can this help us? Many are directly associated with litter bins. Were these bins built to receive further offerings and therefore do they denote benches of particular significance? Were those without bins used for something else or perhaps they belong to a different period? Of course we have answers to all of these questions in the same way that prehistoric peoples fully understood the purpose and place of their structures. With the passage of time the social context of their built environment has been completely lost and we are left only with the material vestiges from which to attempt a reconstruction. Inevitably we fail and with every answer further questions follow. We shall never really understand the prehistoric peoples who lived in the British Isles, but this should not stop us trying our best. Providing we remember that our conclusions are merely hypothesis and that like ourselves people in the past were individuals living within a complex social system we should not go far wrong. Raised timber walkway leading to a platform with a pair of benches. What would archaeologists make of the adjacent hearth? 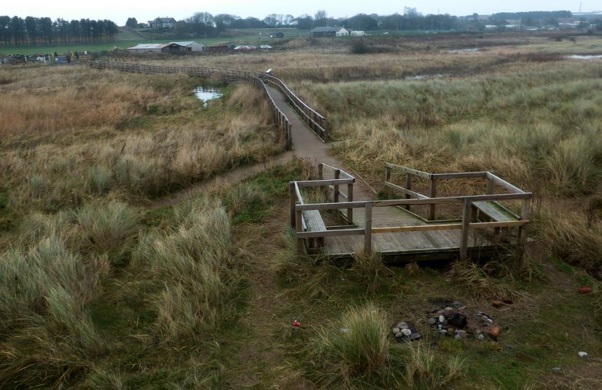 This pair of benches are positioned to provide sea views and the elaborate walkway to protect the sensitive natural environment. Archaeologically this site would survive as a double curving alignment of post holes terminating in a rectangular setting adjacent to a pair of contemporary hearths. Without documentation what are the chances that archaeologists in the year 6,000 AD would be able to accurately interpret this site? 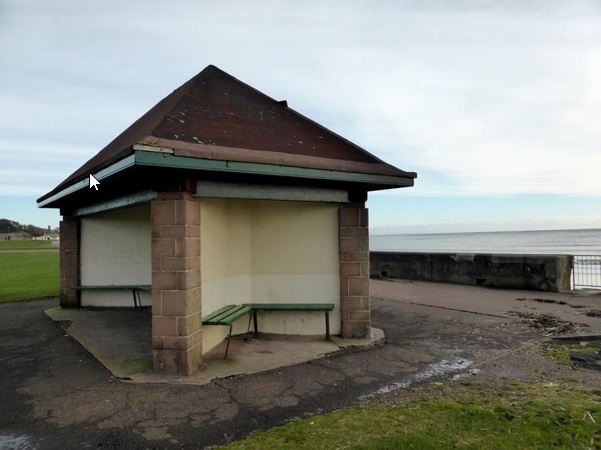 The public benches at this location are built within a purpose-built shelter. Does this mean that these benches have a different function to the open examples? The answer of course is no but what chance would archaeologists of the future have? 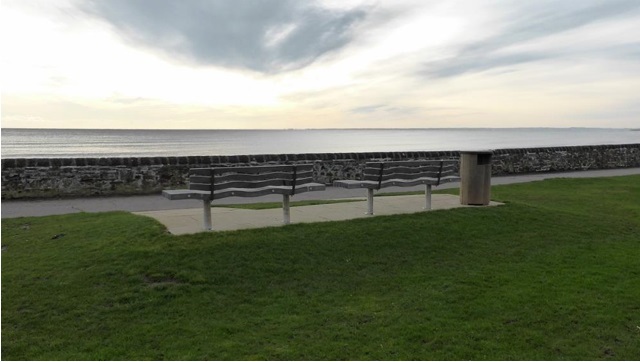 An alignment of benches each with a view of the sea. 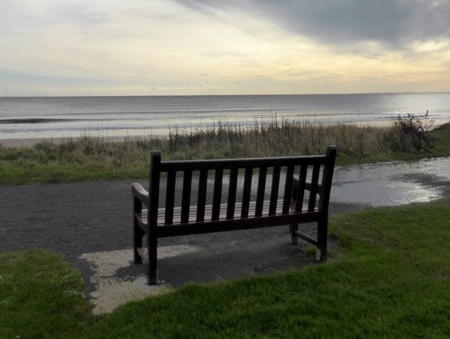 Most are memorial benches does this imply a ritual relationship with the sea? 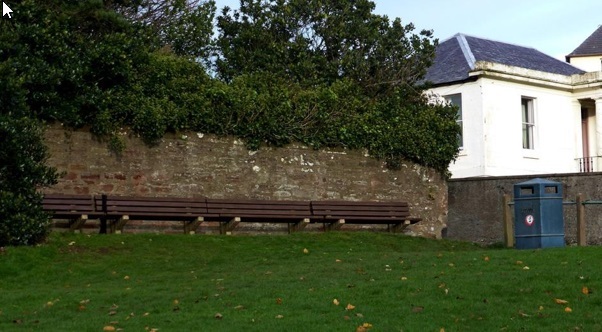 These benches resolutely face away from the playing fields. 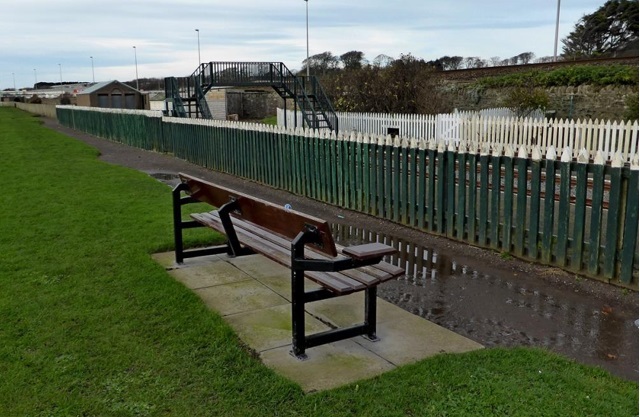 Four conjoined benches and a litter bin. Why so many together and why not four separate benches? The questions are endless and even with a full understanding of function and social context the answers are not always obvious. Benches raised on an artificial mound and provided with a bin. The mound permits views of the sea. Without it the views would be hidden behind the sea wall. 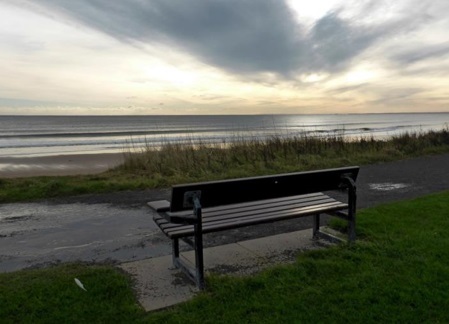 Bench positioned with its back to the sea view. All the others areas have been positioned to provide views to the sea whilst this one has not. 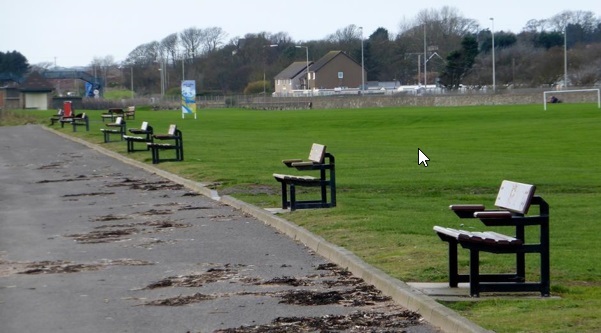 Archaeologists could see this as evidence that the sea played no part in the siting of the benches. They would be wholly wrong. Armed with the knowledge that this is a memorial to the owner of the model railway its position makes perfect sense. 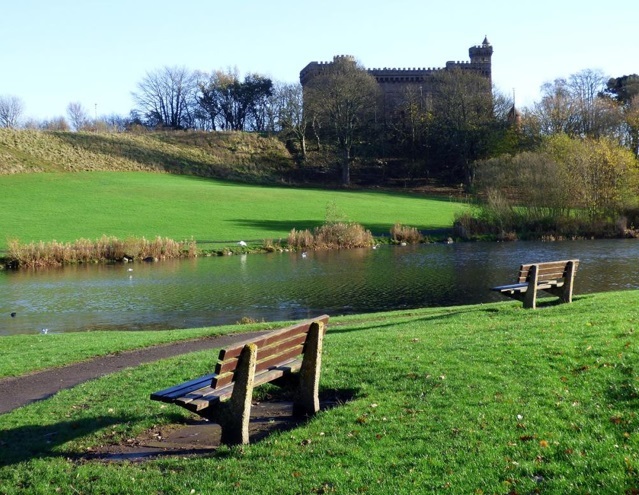 Benches sited to provide pleasing views of the picturesque duck pond and mock castle. A bench with no view at all. 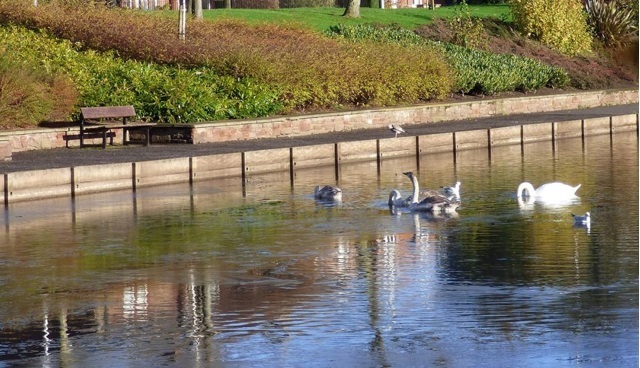 When built this bench would have views across a pond to a picturesque island. Subsequent remodelling of the area means that it no longer serves the function it was built for. This bench is an integral part of the landscaping works. A recess was formed in which the bench was placed. The form of the benches varies considerably. This does not reflect any difference in their purpose. We need to try and remember this when studying the past. 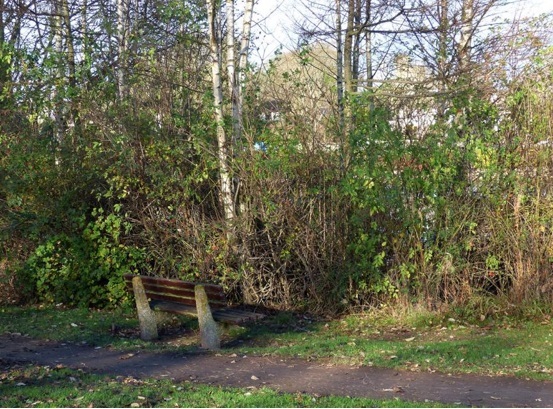 A bench that would be more at home in a back garden than in a public space. The purpose is however clear. Yowling Moggy No. 30 – “a green bridge” will “help the road disappear into the landscape”! Ah, but wait a minute. If, as you walk across it, you glance to your left you’ll see THIS …. half a mile of destroyed archaeology! Far from helping the road “disappear into the landscape” the green bridge will provide a vantage point forcing you to see the full horror of how the road has been gouged into the landscape – a present from our generation to our children’s childrens children. Government signals mass metal detecting rallies to be banned – at last! 1. )“The system will help us to deliver our manifesto commitment to be the first generation to leave the environment in a better state than we inherited it”. Yet it’s beyond all denial that mass detecting rallies impoverish the historic environment, not enhance it. 2.) It will also include “a more effective application of the ‘polluter pays’ principle” which indicates farmers who damage the natural environment will have to pay – and so will those who allow others to damage the historic environment. Soon to be mere history? Two thousand paying artefact hunters helping themselves on archaeologically sensitive fields alongside the Ridgeway in Oxfordshire. About time too? Why does “Charity” + “metal detecting” get you 107,000 Google hits ? It’s a good question. You don’t get charity birdwatching events even though vast numbers of people do that. Yet the 18th Rotary Spring Detecting Rally took place last Sunday near Swindon and that’s just one local Rotary club. Scores of them run rallies and lots of other charities too. Why? It’s simple. Detectorists massively increase their chances of getting permission if they dress up their events as for charity. Since rallies damage the archaeological record how about these charity minded people stay at home, donate £10 each to the charity and donate the cost of the petrol too!